According to a new study published on the web site of the Concussion Legacy Foundation, researchers have discovered brain disease in 95% of brains tested belonging to former NFL players. 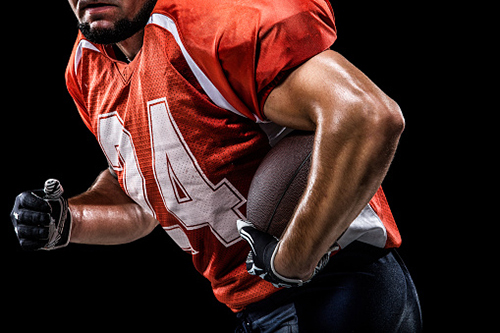 Researchers with the Department of Veterans Affairs and Boston University have identified chronic traumatic encephalopathy (CTE) in the brains of football players who have donated their brains to science. To date, they have identified CTE in the brains of 96% of NFL players and 79% of football players—131 out of 165 people. CTE occurs when a person experiences constant blows to the head over a period of time, which causes damage to the nerve cells in the brain. The damage can impair cognitive functioning and lead to conditions such as dementia or depression. The research team found that 40% of football players who had CTE had played as offensive and defensive linemen—positions that experience significant physical contact. A number of former NFL players have taken legal action against the league in regards to health problems and injuries that they have developed later in life that they believe are associated with the sport (i.e. ALS and dementia). In April, a $1.0-billion settlement with approximately 5,000 former players was approved. In order to determine the overall incidence of CTE in football players, according to researchers, they need to analyze the brains of players who had never experienced any signs or symptoms of the disease. “VA-BU-CLF Brain Bank,” Concussion Legacy Foundation web site; http://sportslegacy.org/national-initiatives/brain-bank, last accessed September 22, 2015. McIntosh, J., “New Study Finds Brain Disease in 95% of Deceased NFL Players,” Medical News Today web site, September 21, 2015; http://www.medicalnewstoday.com/articles/299768.php.